Ph.D Bahman Kalantari is Professor of Computer Science at Rutgers University. He is a Ph.D. in Computer Science, M.S. in Mathematics, M.S. in Operations Research, and B.S. in Mathematics and Physics. His research interests lie in theory, algorithms, and applications and in a wide range of topics that include: Mathematical Programming, Discrete and Combinatorial Optimization, Computational Geometry and Machine Learning Theory. Dr. Kalantari has over seventy publications in a wide range of scientific, art-math and art-science journals. He has also authored a book, ``Polynomial Root-Finding and Polynomiography" as a World Scientific publication released in 2008. He holds a US patent (#6,894,705) for the technology of Polynomiography. The ideas for Polynomiography grew out of Dr. Bahman Kalantari’s research into polynomial root-finding, an ancient and historic subject that continues to find new applications with each generation of mathematicians and scientists. The term “polynomiography”, coined by Dr. Kalantari, is a combination of the word “polynomial” and the suffix “graphy.” A "polynomiograph" is an individual rendered image. 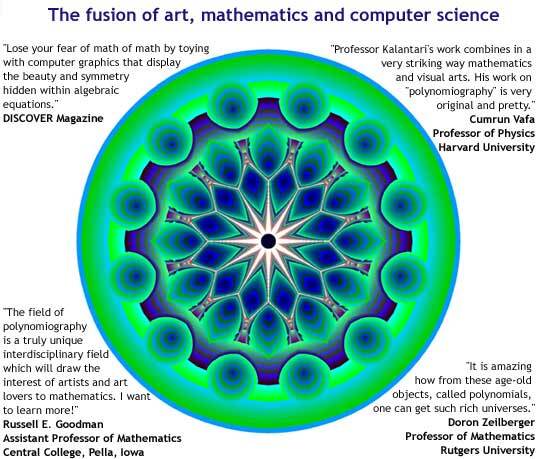 Polynomiography is a fusion of math and art, which as software gives rise to a new form of abstract art. Rendered images are through algorithmic visualization of solving a polynomial equation via iterative methods. Images are beautiful and diverse, yet unique. The software inputs equations or point locations as roots of polynomial equations via a computer mouse. Locations can be arbitrary, or ones that form user’s desired pattern. In the latter case the software converts the points into a polynomial equation and then renders a polynomiograph. Because the input can be numbers, words, sentences, images (or any type of input that can convert into a polynomial) users do not need to understand the underlying mathematics of polynomials. The software includes filtering tools for manipulation of generated images. Education: Polynomiography has had positive feedback from presentations to hundreds of middle and high-school students. The software helps to increase students interest and excitement about learning mathematics and STEM. Design: The images generated by polynomiography can be the source for fabric, carpet or wall paper designs, as well as images imprinted on items of clothing, posters, postcards, business cards, logos, and promotional items. Art: Images rendered by the software become unique pieces of fine art when placed on canvas. Artists and designers can decide to further develop images. Art work that the software generates has been in US and International exhibitions. Image Processing: Many image and photo editing products allow users to add specialty tools (referred to as plugins) into the software. A polynomiography plugin adds the ability to generate polynomiographs as a feature of the underlying image processing software. Security: An interesting use of polynomiography is for the encryption of numbers such as ID numbers and credit card numbers into images that resemble a fingerprint. Different numbers exhibit different fingerprints. Polynomiography generates beautiful abstract works of art that are spectacular and diverse. The software has multiple potential uses and applications. It is a fantastic tool for education at all levels, from children to college level. For use in design it reduces costs by generating images instead of requiring the use of human designers.